From November 8th to 15th, the 2016 Israel Ride participants went on a unique journey to discover Israel on two wheels. This Israel Ride was the largest one so far, counting 177 riders, 12 non-rider participants, and over 60 crew members. 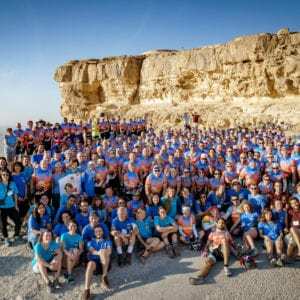 The Israel Ride is held yearly by the Arava Institute and our partner Hazon, to raise support for the Institute’s mission and collect vital resources for the continuation of its programs. The riders made their way from Jerusalem to Eilat, getting to know various places in the country through an extraordinary experience, led by a crew of Arava Institute alumni. A particular highlight of the trip was Arava Day, which gives the participants an opportunity to visit the Arava Institute and Kibbutz Ketura, and brings them together with staff and current students. This year’s activities also included the emotional dedication of “Guy’s Amphitheater” in the Research & Visitors’ Park, which was built in memory of Guy Bar-Yosef, and made possible by the generous donations of his uncle David Eisenberg, numerous other Israel Riders, and the Jewish National Fund.